Mit dieser kostenlosen SharePoint 2013-App der Solutions2Share kann man mit einem Buttom im Ribbon mehrere Dokumente in einer komprimierten Datei herunterladen. Es können auch komplette Ordner oder Dokumtensets heruntergeladen werden und eine Kombination aus mehreren Dateien, Ordnern und Dokumentensets ist ebenso möglich. In den Internet Explorer Versionen 8 und 9 steht die Zip Funktion und das Starten des automatischen Downloads nicht zur Verfügung. Die ausgewählten Dateien werden per Link zum Download angeboten. Unterstützt werden zur Zeit die Standardbibliotheken „Document Library“, „Picture Library“, „Wiki Page Library“, „Forms Library“. The Amrein AZ Index Web Part allows to either interactively filter a Sharepoint List web part or to transmit the selected value as an URL parameter to another page (as for example by placing the AZ Index web part on the homepage to let users select the first letter of a staff member which then redirects the user to the „Staff Directory“ web page). The AZ Index Web Part can be used with Windows Sharepoint Services V3, MOSS 2007, Sharepoint 2010 and Sharepoint 2013. Free to download at Amrein. The SharePoint 2013 and SharePoint Online solution packs contain code samples and documentation that demonstrate how to use site branding and site provisioning techniques, create and use UX components, and address search customization scenarios for SharePoint 2013 and SharePoint Online. Tool to test and debug the Search REST API in SharePoint 2013. Issue GET and POST search and suggestions queries. Use also against SharePoint Online. The SharePoint Client Browser uses the CSOM to connect to a remote SharePointSite Collection and shows the site structure with related properties and values. This set of stencils contains more than 300 icons to help you create visual representations of Microsoft Office or Microsoft Office 365 deployments including Microsoft Exchange Server 2013, Microsoft Lync Server 2013, and Microsoft SharePoint Server 2013. 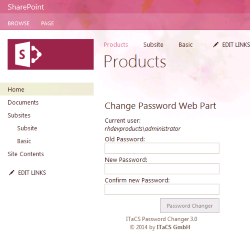 This web part enables users to change their local or Active Directory password from within a SharePoint Site Collection. It is designed for SharePoint Foundation (2010/2013) and the SharePoint Server (2010/2013). Helps create/execute the Disaster Recovery steps performed while failing over Log Shipped databases. Most helpful for multiple databases, such as SharePoint, consolidated SQL Servers, etc. However, it also makes even a single database failover a more straightforward process. SPPoSh is an extension to the out-of-the-box SharePoint Server 2013 PowerShell cmdlets provided by Microsoft. It is entirely free to use! Building on the.NET framework, using the SharePoint Server 2013 Object Model and CSOM, SPPoSh allows users to bridge the gap between developers and IT Pros, allowing a language that is normally only aimed at the IT Pros, to interact with objects at a lower level that would normally be controlled by the Power Users and the Developers. The Social Workplace Power Toys is a series of Reference Implementation solutions intented to demonstrate the power of the Sitrion Social API for custom solutions development. This custom activity for SharePoint Designer 2013 aims within a document library re-inherit permissions from the parent object of an item, the project now has to use a single activity, a posteriori will be adding more activities to make it a Activity pool. SharePoint solution allow the administrator to design the custom business process to validate list items. This versatile SharePoint 2010 & 2013 webpart allows you to display geo data from your SharePoint using Google Maps. Do you miss the language switching functionality from SharePoint 2010? We do! Solutions2Share developed a little tool which brings the Language Switcher back to SharePoint 2013. It’s free to download. SPSBackUp is a PowerShell script tool to Backup your SharePoint environment. It’s compatible with SharePoint 2010 & 2013. Die WM Tippspiel-App kann über den Microsoft SharePoint AppStore hier heruntergeladen werden, ist mobilfähig und kostenlos. Die App ist zur Zeit lauffähig auf Office 365/SharePoint Online. Office 365 Drive Mapping for use with Enterprise Desktops. Allows users to utilize the technology known as SharePoint Online for folder redirection. This project is to enable the use of Office 365 as redirected folders in Microsoft. Specifically, this script and method can be used on a Windows 7 desktop (or higher) with Citrix and roaming profiles (or any persistent profile method). What makes this unique is that no local storage is used (unless you can’t connect to office 365 and then it’s only temporary). In SAML authentication mode, SharePoint does not try to resolve user input in the people picker, and anything users type is validated without any check.